For five days every semester, I cease to be Brad. I stop wearing jeans and sweaters. I spend most of my day off-campus, leaving early in the morning and coming back late in the evening. You see, for five days every semester, I spend my day down at the State Capitol as part of the Oklahoma Intercollegiate Legislature (OIL). I wear my newly-dry-cleaned suits, sit in state legislators’ seats and answer to Senator Crofford. 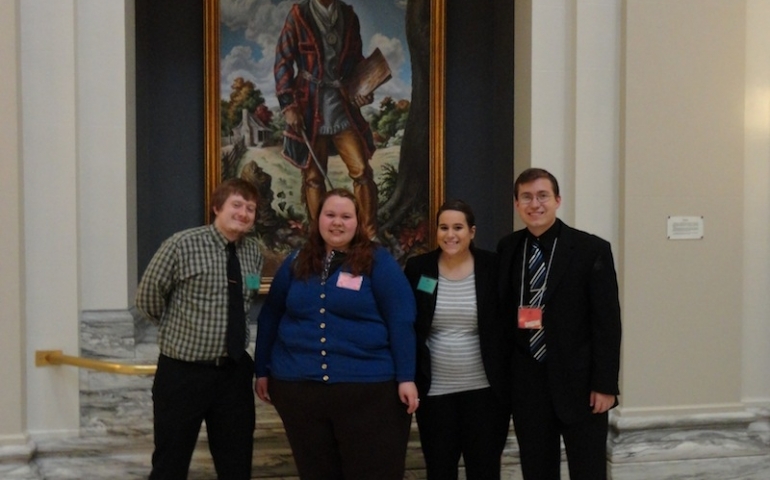 Students from fifteen Oklahoma colleges and universities gather to compete in the OIL House of Representatives, the Senate, a moot court competition and a journalism program. This fall was my sixth semester of OIL. When I started in the fall of 2009, OIL was a way to fill a void. In high school, I had competed in extemporaneous speaking, Lincoln-Douglas debate, mock trial and student congress. For the first few semesters, participating in OIL gave me a similar rush. I would get excited as I would research a social issue, write legislation, present it to my peers, debate it and finally vote on it. I thought of myself as a competitor, eager to do well and hopeful of winning one of the awards, such as Best Freshman or Best Delegate. OIL has ended up meaning far more to me than any awards ever could have. I have made friends from schools throughout the state. I have learned about a variety of topics, from grass rights to mammograms, from employment discrimination to illegal immigration. I have been exposed to a wide array of viewpoints and perspectives. I have learned parliamentary procedure, which allows me to listen to and understand the procedural aspects of the Oklahoma legislature when it’s in session. I have come to better understand the tradeoffs legislators face when it’s time for a final vote when a bill is mostly good but has a few real problems. Having spent about 30 days at the Capitol for OIL, I have become very familiar with the setting, tbut here are still moments that leave me silent in awe. Turning south on Lincoln Boulevard and seeing the sun shine behind the Capitol’s towering dome. Looking up at the beautiful stained glass ceilings of the Senate. Leaning back in a state representative’s chair as I listen to former Oklahoma Governor George Nigh’s address at the beginning of the week. OIL has been one of the most enjoyable, most instructive and most beneficial experiences of my college career. If you are interested in learning more about OIL, come and talk to me or shoot me an email. I love talking about it (obviously). You can also talk to SNU’s delegation chair, Tim Rice.